Apple computer users can now easily keep their VXi BlueParrott headsets up to date with the latest firmware, features and functions. With VXi Updater for Mac, Apple computer users can control a variety of BlueParrott headset features and functions, including configuring the programmable Parrot Button on the B350-XT (shown here). The VXi Updater software is essential to utilizing the full capabilities of our BlueParrott headsets. We’re pleased to make it available to all the VXi BlueParrott customers out there who are also Mac users. VXi Corporation announced today that its VXi Updater™ software for BlueParrott® headsets is now available for Mac computer users. By installing this complimentary software on their computers, customers can be sure their BlueParrott headsets always have the most current capabilities. 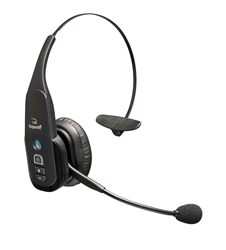 VXi’s latest BlueParrott headsets (VXi BlueParrott B350-XT, Reveal™ and Point™) are designed to be updateable, offering new features and functions as they become available. VXi Updater software for Mac gives users running Mavericks (OS X 10.9), Yosemite (OS X 10.10) and El Capitan (OS X 10.11) convenient access to these customizable advancements. Customers simply need to download the application from the VXi Updater page and install the software on their desktop or laptop computers. (When downloading, users can sign up for future software update notifications.) Once the VXi Updater is installed and connected to a BlueParrott headset via USB, the application is straightforward and easy to use. In addition to updating the headset’s firmware, VXi Updater for Mac can also control a variety of BlueParrott features and functions, including configuring the Parrot Button™ on the B350-XT, clearing the headset’s pairing memory, activating/deactivating Multipoint Pairing, and enabling/disabling media streaming. VXi Updater for Mac is easily accessible on the VXi Updater page on the company’s website. For additional assistance, please contact VXi’s Technical Support Team at 800-742-8588. They’re available Monday through Friday, 8 a.m. to 8 p.m. ET. BlueParrott is a registered trademark of VXi Corporation. Point, Reveal, and VXi Updater are trademarks of VXi Corporation. Apple, Mac, and OS X are registered trademarks of Apple Inc. Bluetooth is a registered trademark of Bluetooth SIG and is used by VXi under license.